Allison’ turned 4 month’s old on Friday. Can you believe it’s been 4 months already?? I sure can’t. She is getting bigger and bigger each day. Yesterday I went through her closet and took out all her newborn cloths. It was sad, but it had to be done. She’s wearing right now 3-6 months but there are a few of her 0-3 month one piece dresses that still fit so I kept those for a few more weeks. It seems like she is getting very tall. I can’t wait till Thursday for her appointment to find out exactly how much she has grown. 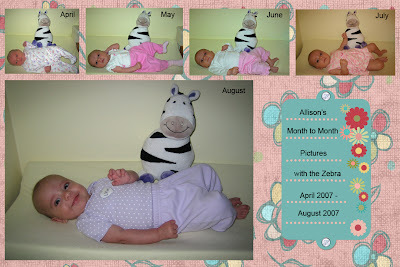 I took the monthly picture with the zebra and put them all in a collage to see the difference each month. It’s amazing how much she has changed!! I also started her on Rice cereal on her 4 month birthday. I probably should of waited till she went for her appointment, but I didn’t. She really likes it. At first she wasn’t too sure, but after a few spoonful’s she was sold. By the 3rd day, she was really enjoying it. I have to give her the bottle first or she can’t eat fast enough but then she really enjoys the cereal. She’s also still sleeping through the night. She’s always been a great sleeper and she just keeps getting better. And she wakes up so happy, it’s wonderful. 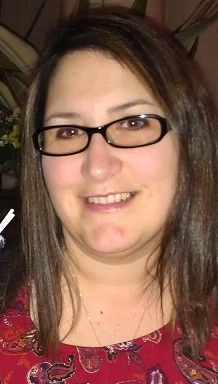 Allison’s first spoonful of cereal…. It’s amazing how big Allison is getting! Time goes by so quick!! Your girls are so cute and just keep getting cuter (if that’s really possible!). Love the progress chart. I always wish I would have done that for Kyler. ooohhhh she’s not 4 months already! What a doll!